Arctic ice has melted before — it has nothing to do with climate change. It's not a coincidence. As carbon pollution warms the planet, Arctic ice is shrinking to record-lows. Has Arctic sea ice changed before? Absolutely! Nobody disagrees with that. But arguing that man-made warming isn’t melting sea ice is like arguing humans can’t cause forest fires because they've been started by natural causes in the past. The amount of summer sea ice in the Arctic has dramatically declined over the last 30 years. And the oldest, thickest ice is getting thinner. Right now, Arctic sea ice is disappearing faster than at any time in at least the last few thousand years. If this pace keeps up, the Arctic could be ice-free in summer as early as 2035. Arctic sea ice has aptly been termed a "canary in the global warming coal mine," or in other words a sensitive indicator of climate change. Because of its importance as a diagnostic of global warming, climate change skeptics struggle to explain the decline of Arctic sea ice as a natural phenomenon. Satellite measurements of Arctic sea ice extent (Figure 1) reveal a rapid decline over the past 30 years, particularly at the end of each year's annual melt season. The downward trend and the increasing difference between seasons are in keeping with predictions of the effects of global warming. As the Arctic warms, the volume of ice in the region gradually declines, making it less likely ice will survive more than one year and thus exposing more open water at the end of each melt season. 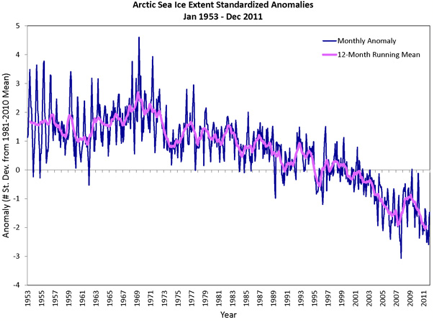 Figure 1: Trend in Arctic sea ice extent, 1953-2011. Source: National Snow and Ice Data Center. As an explanation for the decline of Arctic sea ice, skeptics hypothesize we're seeing the effects of natural cycles causing deep, decades-long swings in Arctic ice coverage and volume. Lending observational support for such cycles is much more difficult than relying on direct observations of ice extent with contemporary instruments. Still, thanks to ocean sediment cores and some other physical clues left by past climate regimes, we have reasonable insight into past Arctic sea ice extent. Combining various information about past climate behavior, we can better understand why changes in ice coverage have occurred in past times, whether those natural variations are happening today, and how those changes compare to today's sea ice trend. In sum, although natural factors have always influenced the state of Arctic sea ice, research strongly suggests that today's decline is driven by the novel influence of anthropogenic CO2 we've added to the atmosphere.